HAZAID Hazard Cataloguing and Risk Assessment Tool is used to record the Fatigue Hazard Analysis (FHA) risk assessment information gathered during a FHA workshop. It is highly visual and interactive, and is used to ensure a high standard is maintained for information captured during the workshop process. Tasks (WHAT / WHERE?) – e.g. operation of equipment. Details and statistics of accidents and incidents for the organisations’ industry that are available from the organisations’ insurer. Existing Controls are noted and the effect on the organisation as a result of a scenario is then determined and noted, e.g. 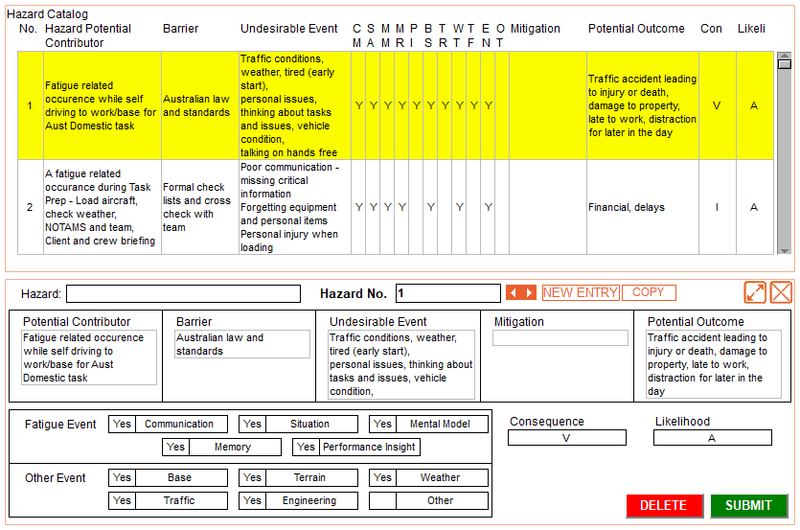 During the FHA, HAZAID is used to establish a catalogue of hazards, and Consequences and Probability are identified. By loading a FAID Quantum Hours of Work dataset, it is then possible to view the Fatigue Matrix based on selected Fatigue Tolerance Levels.